This month, I was so excited to be 21, a lucky number. I believe that every year I should celebrate the day I was brought into this life. And the 7th of October was indeed a fortunate day. Rain, rain, rain everywhere. It was the first rain this autumn and what a beautiful gift from heaven for my birthday. I waited for more than 60 minutes, while having a shower under the rain, hoping to find a taxi to drive me to the university. Finally, I found a taxi and got in, completely wet, yet so happy it was raining. As the taxi moved forward, I was listening to the radio as it broadcast songs about intifada and Palestine. While looking through the window at the rain, I thought about how much I love listening to these songs; they remind me of heritage. But I wondered why local radio channels were suddenly playing these songs. The rain was becoming heavier and heavier, and the taxi was inching along more and more slowly. After a few minutes, the radio announced there was fighting in the West Bank, with many deaths and injuries. Then the broadcaster said Palestinians are on the way to a new uprising, as a reaction against aggression by illegal settlers, who are protected by the Israeli army. My day suddenly shifted 180 degrees; all I wanted to do was to join them, to help protect my people from the oppression. Sadly, I was helpless; I had no way to help but pray. We believe our prayers are always answered during rainy days. In the following days, Israel continued its crimes against the people in the West Bank. To date, 50 Palestinians have been killed and more than 5,000 injured (compared to 10 Israelis killed and about 200 injured). Nearly 900 Palestinians have been detained by soldiers and police. The more the Israelis penalize us so disproportionately, and deprive us of basic human rights, the more our resentment and rage grows. 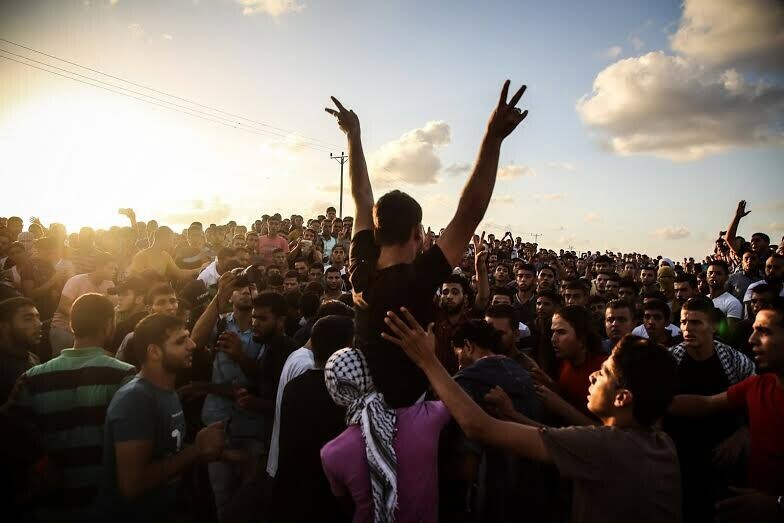 People in Gaza could not stand by without doing anything. Young men and women organized several peaceful protests, condemning the situation in the West Bank. However, this didn't help much since Israelis continued to harass and attack Palestinians in Jerusalem and other parts of the West Bank. What made me feel really sad were the young boys and men who went to the “no-go zone,” the land along the Israeli wall that we are banned from entering, despite the fact that we own it. The Israeli army attacked them with its heavy weapons and tanks, while the Palestinians only had stones that cannot reach more than 10 meters. Those young men didn't know that exercising their right to their land and to defend themselves also would bring about the end of their lives. My fear? The rage that led to the killing of eight young men in Gaza will be in vain. That even a Third Intifada will be in vain. The settlers won’t stop beating up Palestinian children, and Israeli soldiers will continue to shoot Palestinians at check points, then claim it was merely self defense. As of now, 43 Palestinians have been killed and more than 3,400 injured due to the aggression by Israeli soldiers settlers (compared to the death of seven Israelis, with 106 injured). I hoped that my 21st year would be a beautiful year, yet I am afraid its beginning represents the opposite. Nevertheless, I also believe this uprising in the West Bank and the support by the Gazans will lead to something more than beautiful. It might lead to our real independence. Riham El Naji, 21, is a writer for We Are Not Numbers and a student of English literature at Gaza’s Al Azhar University.